Imagine yourself on a multi-day Oregon bicycle adventure, pedaling along the most scenic and least traveled roads you’ve ever experienced. 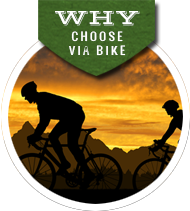 Your entire journey complemented with great food, comfortable lodging, a small group of like-minded traveling companions, and friendly, local, Via Bike Tours’ guides with a support van and a passion for fun exploration. You are exhilarated with what you accomplish under your own power, the friendships you make along the way, and the absolute beauty of the diverse natural environments that envelop you in your passing. Best of all, you are so relaxed and in the moment, you don’t even know what day it is. You don’t have to worry about anything because Via Bike Tours is taking care of all the details. This is the life. A dream vacation fulfilled. Turn this image into reality by exploring the magic of Oregon with Via Bike Tours. We can create a custom tour for you, or you may prefer to choose one of our pre-arranged, fully supported, inn-to-inn tours. 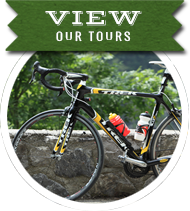 Take a look at our Tours Overview page to see how we operate. Then peruse the pre-arranged tours for route details and daily agendas. Most importantly, take that first step toward fulfilling your dream vacation and reserve your spot on a tour now while space is available. 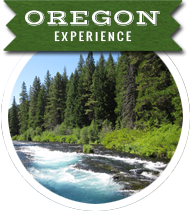 "I can't say enough good things about this company or the amazing Oregon Bike trip."